Department of Homeland Security Secretary Kirstjen Nielsen—the official responsible for implementing Trump’s cruel family separation policy—was forced out of her job yesterday. Why? 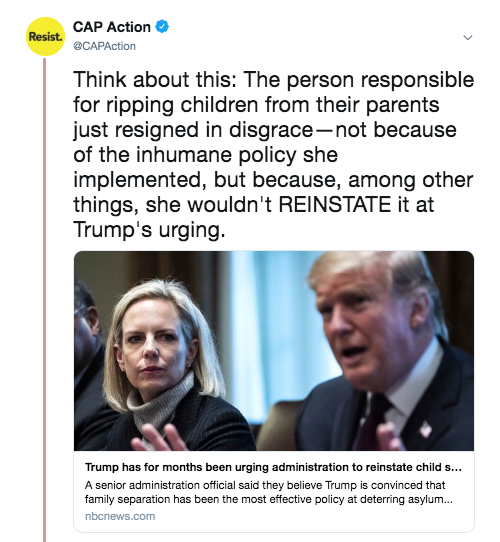 Because she refused to re-instate the policy of ripping children from their parents, among other horrific and illegal demands. Trump is determined to enact his hateful, racist immigration policies. He just forced out his DHS secretary to prove it. Share this tweet thread to spread the word. Nielsen enacted Trump’s family separation policy—cruel enough on its own—but did it in such an inept way that the Administration says it will take years to track down the children who were separated from their parents. She also lied about it a lot, repeatedly claiming that there was no policy of family separation, and that the Trump administration doesn’t use cages for children. She is the 15th member of Trump’s corrupt Cabinet to resign or get fired (many of them unceremoniously via tweet). Nielsen turned our Department of Homeland Security into an arm of Trump’s campaign, stripping resources from combating terrorism and violent criminals in order to fund family separation and detention. Nielsen was cruel enough. Now, she’s out, and it’s clear that Trump plans to enact even more inhumane policies going forward. Share this tweet thread to make sure your followers have the facts. TAX RETURN TIME: The deadline for the IRS to provide Trump’s tax returns to House majority leaders is Wednesday, April 10. It would be illegal for Treasury Secretary Steven Mnuchin to obstruct the request and keep Trump’s returns hidden. Remember all the times Trump promised to release his tax returns? Well, he’s refusing again, and his chief of staff is promising that House Democrats will never see the returns. We’ll ask again: What is Trump hiding? RELEASE THE REPORT: Attorney General Barr is STILL refusing to release any of the Mueller report—including the public summaries Mueller prepared for public release.